One of the BIG boys here at Quillisascut. The General staged a Coup d’etat and knocked Viceroy off his throne. 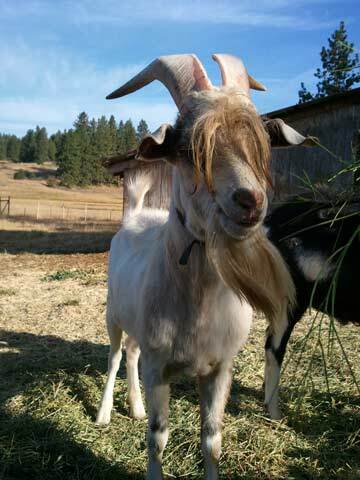 He has the moves, the biggest set of horns ever and look at those invincible bangs, Stylin’. He drives the girls wild! The General was super-sized when he was born late in February 2011. Butterscotch is his Mom (Freckles his Grandmother). His Dad was a Boer X buck that was visiting the girls that fall. The General was the only kid that we could see any Boer like qualities. Truthfully, I have not spent much time with him, I leave the bucks to themselves. It is helpful if they are respectful enough to keep their distance from humans, yet tame enough that we can get a hold of them if there is a need. Which means he is admired from a distance. Does he remind you of someone? He’s Gandolf the Wizard Goat! Chris thinks he kind of looks like Andrew Jackson. Andrew Jackson, I need to see a photo. Did he have long greasy bangs? Jackson was also a general and had pretty bushy eyebrows, especially when he was older. You might want to keep yours away from Native Americans, just to be safe. Oh my! The names we give our kids can carry so much baggage.